Turn discrete data into relevant information. Be sure your care teams have the information they need for clinical decision-making. MEDITECH’s wide range of Clinical Decision Support interventions (CDSi) include active formats that engage clinicians while ordering or documenting, and passive formats that require clinicians to take action, such as linked references. Our evidence- and experience-based content is embedded in Expanse to give your organization immediate EHR benefits. Tools from collaborative vendors round out our CDS options, helping healthcare organizations of all sizes to improve patient safety, quality metrics, and efficiency — the goals of value-based care. Built in, for better outcomes. Keep a close eye on patients’ conditions, whether they’re outside or inside your organization. Patient Registries and Surveillance work in tandem to identify patients who may need your attention. Pre-loaded content includes standard displays, rules, and algorithms to help you monitor and manage common conditions, HACs, and quality measures. Use it as is, tailor it to meet your patients’ needs, or create your own. Advance clinical decision-making from day one. Our multidisciplinary Standard Content is evidence- and expert-based. 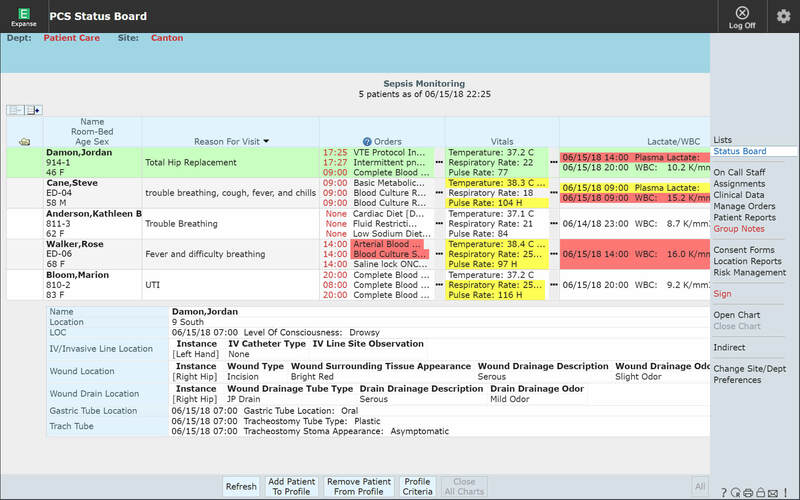 Plus, it’s coordinated with best practice workflows, for safer patient care from the start. 600+ documentation templates — developed by our physician team — address key specialties. EHR Excellence Toolkits for CAUTI, sepsis, fall risk, and diabetes management include content, plus optimal workflows and system guidance to improve outcomes. Coming soon to Expanse: Opioid Stewardship Toolkit. Clinical Rules Database reduces obstacles to decision support. Search our repository of approved, multidisciplinary rules for common workflows and issues. Monitoring tools for alerts and clinical standardization minimize alert fatigue, track care variations, and fine-tune quality improvement programs. MEDITECH has joined forces with the best knowledge vendors in the industry to simplify CDS acquisition. The results? You get their content embedded in Expanse’s clinical workflows. Evolving to meet physicians’ needs. “These tools aren’t meant to replace physicians,” said Bryan Bagdasian, MD, physician informaticist. He explains how MEDITECH’s CDSi augments care processes for providers, in this Facebook Live video with Janet Desroche, AVP, Client Services Division. Watch the entire interview on Facebook. "We implemented evidence-based clinical practice guidelines, making it easy for physicians to follow best practices by using automated clinical decision support within MEDITECH’s physician documentation, and we’ve seen significant results." “You can’t possibly pick up on every indication of a patient that could be going downhill fast. Having these status boards and surveillance tools, we can now flag someone in real time and say ‘Maybe you should go take a look at this patient.’"
Find out how MEDITECH's Surveillance solution and our Sepsis Management Toolkit helped Hilo Medical Center improve SEP-1 compliance by 34 percent.